Die Vorgeschichte zu Dragon Age: Origins, verfasst von Dragon Age Lead Writer David Gaider. Invitingly designed, illustrated with hundreds of pieces of lush art from the creators of the games, this is the definitive guide to BioWare's dark fantasy masterpiece! For Dragon Age newcomers, this comprehensive volume brings you up to speed on everything you need to know about the regions, religions, monsters, magic, and more! For dedicated fans, never before have the secrets of BioWare's epic fantasy been revealed so completely and so compellingly! This dramatic, accessible, beautiful tome illuminates the darkest corners of the Deep Roads to the most illusory reaches of the Fade, taking readers on a journey through one of the most fully realized fantasy universes of our time! Written by and starring Felicia Day, Dragon Age: Redemption is a six-part series based on Bioware's Dragon Age video game franchise. Die Zerstörung des Zirkels der Magie in Kirkwall hat bei den Magier und Templern in ganz Thedas für großes Chaos gesorgt. Einige Magier wollen sich gegen ihre Bewacher, die Templer, erheben, während andere sich dafür einsetzen, inmitten der Wirren, Ordnung und Stabilität zu bewahren. Im majestätischen Weißen Turm in Val Royeaux, dem Machtzentrum der Templer, erreichen die Anspannungen ihren Höhepunkt. Die Taten einiger Radikaler haben die Aufmerksamkeit der Sucher auf sich gezogen, einer mächtigen, geheimen Abteilung der Templer, die nun koste es was es wolle das Kommando übernehmen und die Ordnung wiederherstellen will. Was die Lage noch verschlimmert: Ein geheimnisvoller Mörder sucht die Hallen des Weißen Turms heim, unsichtbar für alle, bis auf einen einzigen Magier. Da Rhys als Einziger den Mörder sehen kann, rückt er als Hauptverdächtiger ins Zentrum der Ermittlungen. Rhys glaubt nicht, dass er seine Unschuld beweisen kann: Seine Zukunft erscheint ihm daher kurz und trostlos. Doch dank seiner magischen Fähigkeiten erhält er eine Schonfrist: Er muss an einer Expedition teilnehmen, die tief ins westliche Ödland von Orlais führt. Dort verbindet sich sein Schicksal mit dem einer wunderschönen Templerin, dem einer gequälten Seele, und mit dem von Wynne, der Heldin der Verderbnis. Zusammen decken sie ein Geheimnis auf, das viel bedeutender ist, als sie es sich hätten vorstellen können. Ein Geheimnis, das das Schicksal der Magier in ganz Thedas für immer verändern wird. Das fantastische mittelalterliche Reich Ferelden wird regiert von einem Ritterorden der Magier unter Führung einer weisen Magierkönigin. Davon abgespalten haben sich vor langer Zeit sogenannte Blutmagier, weshalb ein ständiger Bürgerkrieg schwelt und die auch die noblen Magier einander nicht mehr überall über den Weg trauen. Nun hat ein Blutmagier namens Fenic dem Reich den Krieg erklärt, und es ist an der Spezialagentin Cassandra, dessen Pläne zu durchkreuzen und seine Verbündeten im Orden zu enttarnen. 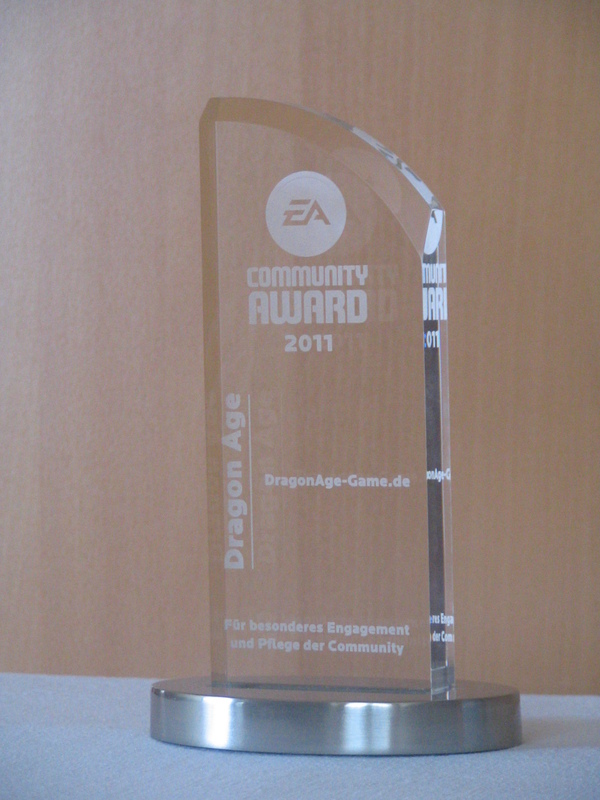 Erlebe den epischen Nachfolger des Spiels des Jahres 2009 von den gefeierten Schöpfern von Dragon Age: Origins und Mass Effect 2. Du bist Hawke, einer der wenigen, die der Zerstörung deiner Heimat entfliehen konnten. Journey into the darkest and deadliest part of Orlais, where the weight of titles matters less than the strength of blades. Empress Celene of Orlais rose to the throne of the most powerful nation in Thedas through wisdom, wit, and ruthless manipulation. Fantasy roleplaying goes back to its dark and gritty roots with the Dragon Age RPG, the latest game from the company that brought you A Song of Ice and Fire Roleplaying and Mutants & Masterminds. Based on the smash hit Dragon Age: Origins computer game, the Dragon Age RPG brings the excitement of BioWare's rich fantasy world to the tabletop. Make your own heroes and control your own destiny in the lands of Ferelden and beyond. The lead writer of BioWare's hit Dragon Age games concludes King Alistair's epic quest - in a journey beyond reality itself! Fans around the world have recognized the Dragon Age comics to be an integral addition to the videogame saga. Now, series writer David Gaider pits King Alistair and his noble companions Varric and Isabela against their most nefarious foe - the twisted blood mage Aurelian Titus! Don't miss what critics are calling "wonderful, exciting examples of the fantasy genre in comic book form!" Available in print for the first time, "Dragon Age: The Silent Grove" is the perfect introduction to BioWare's dark fantasy universe! In this essential, canonical story from David Gaider, lead writer of the games, King Alistair, accompanied only by rogues Isabela and Varric, embarks on a quest deep inside the borders of Antiva - a nation of assassins! Together, they will encounter a prison break, dragons, the mysterious Witch of the Wilds, and one of the greatest secrets in the history of the world! Tells the story of reluctant monarch King Alistair who travels to an empire of evil mages. Accompanied by the pirate captain Isabela and the underworld merchant Varric, Alistair will stop at nothing to uncover the fate of his lost father - even if it means battling an army of cultists singlehandedly. Helping set the stage for BioWare's hotly anticipated Dragon Age: Inquisition, this deluxe oversized hardcover collects every Dark Horse Dragon Age comic to date--The Silent Grove, Those Who Speak, and Until We Sleep— an epic trilogy complete in one volume, written by Dragon Age lead writer David Gaider! This edition also features extensive annotations from the creators of the comics as well as a section of never-before-seen related material.